Anyone who keeps cash, expensive jewelry, guns, or other valuables in their home may experience moments of worry when they leave the house each day. Hiding important items under the bed or inside a lingerie drawer aren’t the smartest ideas. If you want to intensify your sense of security when it comes to your valuables and firearm security, consider storing all of those items inside the 9g Products INPRINT Biometric Fingerprint Safe. This strong, technologically advanced safe is roomy enough for everything that is of value to you, plus it makes a secure place to lock away weapons. With this unit, you won’t have to worry about your most precious treasures when you leave your home ever again. What makes this safe so secure is the state of the art manner in which the locking mechanism releases. There is no key to keep track of and with which you’ll have to fumble when it’s time to open the safe. Instead you’ll use your fingerprint to access your valuables. It’s easy and fast. And it means that there can never be unauthorized access to your valuables because the safe simply won’t open any other way. You can register up to 15 fingerprints, so you’ll be able to encode all of your fingers or add your spouse or other trusted person to the system. Setting up each fingerprint is easy. Instructions are written in simple terms and you’ll be able to get your safe up and running quickly. Then just put your valuables inside the safe and lock it. If you ever need to reregister new fingerprints or delete old ones, you’ll find that is an easy process, too. The construction of the INPRINT is rugged steel for strength and durability while the interior features a foam lining so that even your most delicate jewelry will have a comfortable resting place. Documents will be protected from moisture. Cash and coins will be safe and secure behind the INPRINT’s locked door. Weapons will be locked securely away from curious children. The INPRINT weighs only fifteen pounds, but it is hefty enough to hold almost anything that you want to protect. The exterior dimensions are 12 inches long by 11 inches wide by 7 inches deep, making this safe large enough for documents, jewelry, firearms – even some laptop computers will fit inside this roomy safe. A 9-volt battery powers the fingerprint scanner, providing energy for months of operation…perhaps even longer. While its light weight does make it easy for someone to carry off this safe, bolting it down negates that problem. Fortunately the INPRINT can be secured to any flat surface for that extra measure of security. Bolt it to the top shelf of your bedroom closet or to the floor of a pantry. Fix it into place under your stairwell or inside a cabinet. The INPRINT can even be bolted firmly inside the trunk of your car for those times when you need to secure your valuables when you’re on the road. Mounting it anywhere in your house will make it impossible for anyone to walk away with this safe without going to so much trouble that you’re bound to catch them in the act. 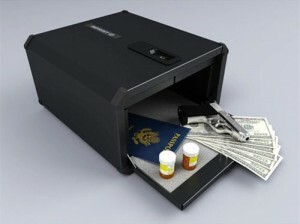 Where Can You Buy This Biometric Safe? The INPRINT can be purchased from Amazon.com – we recently checked the prices and they are probably the best available. Check them out to see the pricing, it’s a good place to start if you are looking to buy one of these now. There’s a couple of 5 star reviews over there as well, from people that are very impressed with this safe and it’s strength. Users have praised this safe for how quickly they are able to access their valuables, and for the sense of security they feel from knowing that their money, jewelry, and important papers are protected. The safe is a great place for gun owners to lock away their weapons where children cannot get at them, but it still provides quick access the swipe of a finger on the reader to the owner if needed. The steel construction impresses other owners of the INPRINT, giving them the reassurance they need that no one will be able to physically break into the safe. Made in the USA, the 9g Products INPRINT Biometric Fingerprint Safe takes advantage of the latest in American technology to bring consumers the ultimate in security. With this safe, you can sleep easily every night, knowing that your important possessions are safe and secure. And you’ll feel that same sense of security when you leave home every day, knowing that your valuables will sit in safety while you’re away. http://www.youtube.com/watch?v=U9_nwFH7-Ks is a review of the newer smaller version – Inprint Micro.